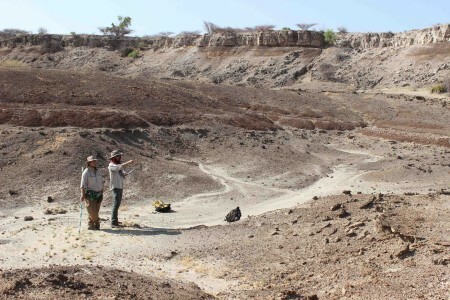 Part of learning about the geology of the Turkana basin is to visit and examine rock exposures related to archaeological and fossil sites and how to interpret the former landscape of past life. 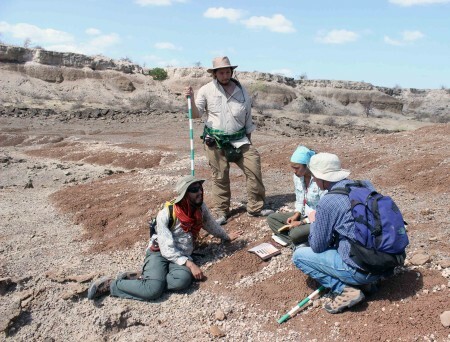 For this next part of the field school, Dr. Feibel told of the geologic history and gave us a tour of the historic site of the KNM-ER 1470 hominin find, along the Karari ridge. This fossil is a nearly complete cranium of an early Homo species that is about 1.9 million years old. 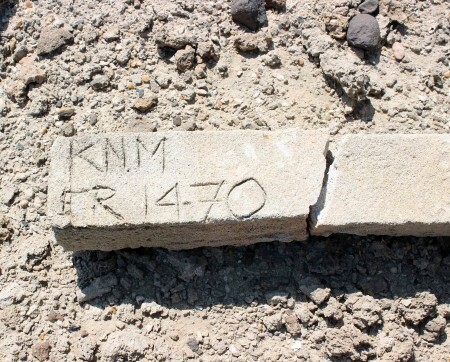 A marker to indicate the site of the famous KNM-ER 1470 hominin fossil. 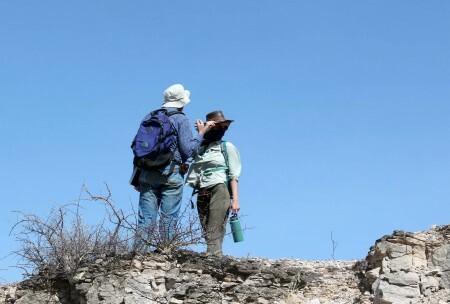 The age of this fossil find has a history of contention, as methods of dating using volcanic ash have changed and improved over time. Dr. Feibel described the complicated story of how the discovery of KNM-ER 1470 had many different interpretations due to results of radiometric dating that conflicted with other laboratory dating results AND for particular fauna species. 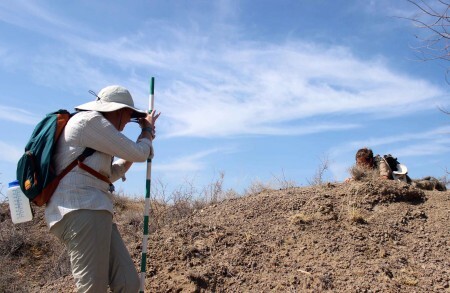 For example, many paleontologists could not understand how a suidae species could be older when they have been found in younger deposits over 100 km away. Overall, this story changed what and how data can be reported to the public and the importance of reporting laboratory results that can be reviewed by other scientists in the same field. Dr. Feibel discusses the history of the KNM-ER 1470 discovery. Along the hike, Dr. Feibel pointed out different rock layers so they could see first-hand the layers of paleo-lake, deltaic, river, and floodplain environments in this area approximately 2.0 – 1.5 million years ago. Dr. Feibel describes the changes in environments through time in the area where KNM-ER 1470 was discovered. Maddie and Niguss take a closer look at the type of rocks in this area. Geologists reconstruct timelines of past environments that help us place archaeological and fossil finds in spacial and temporal context. But it takes a lot of work to reconstruct this context in the field. Two methods used that help to build our understanding of the past landscape are mapping and creating stratigraphic sections of a succession of rock layers. A geological map shows the spatial extent of different exposed rocks in an area for a particular period of time (see diagram below). On the other hand, a stratigraphic section (see diagram below) cuts through the ground vertically, and is a representation of how these depositional environments stack upon each other over time. 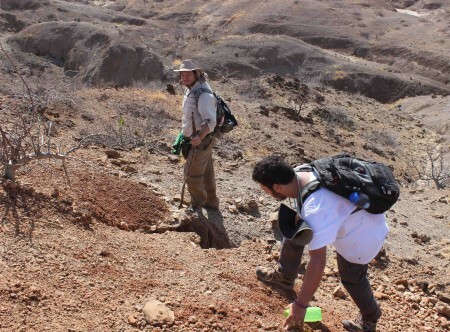 TBI Ileret campus sits on and among a set of deposits that record a number of geological processes and events. 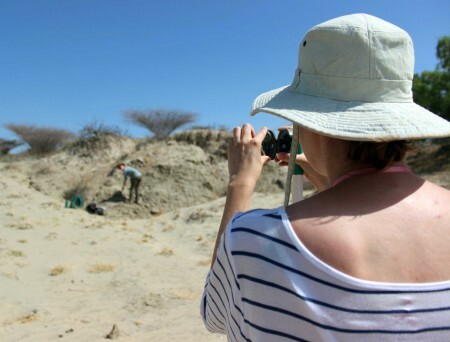 Mapping the geology of the area allows us to see the the lateral extent of particular rock units of the same period of time and even across the basin to examine the paleogeography of the area. In addition, discontinuous beds in a localized area or across a region can indicate past erosion, period of non-deposition, or faulting may expose older rocks on one side and younger on the other. 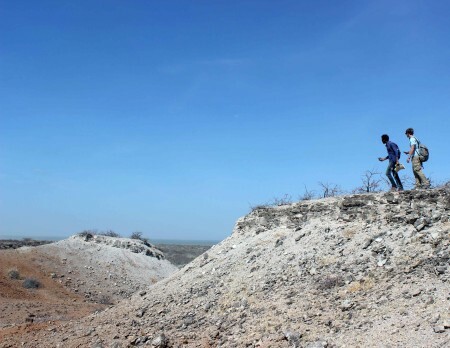 Overall, interpreting the past landscape is not an easy task. 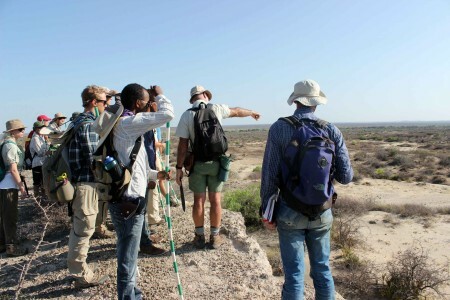 In our next task, Dr. Feibel and Prof. Raynolds instructed students how to create a geological map of areas surrounding the TBI Ileret campus. 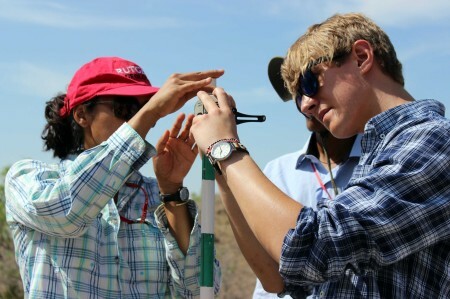 The students split up into teams, using GPS units to follow the extent of 1 rock layer such as a distinct fish fossil bed and a tuff. 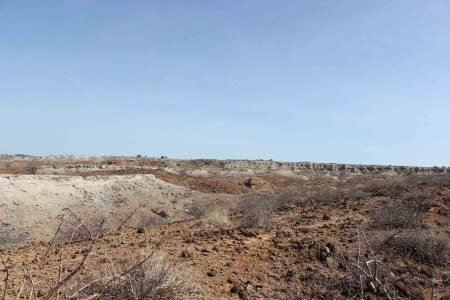 A view of the ridges next to Ileret camp. You can see the red deposits of the main fish bed and the white deposits of the Chari tuff. 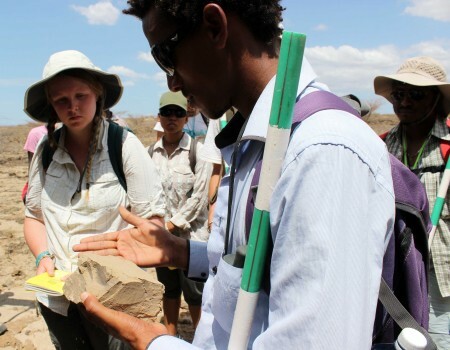 Tadele, Yemane and Evan were responsible for mapping the Lower Ileret tuff that dates to about 1.53 million years ago. This provides a base date for the deposits involved in this mapping project. 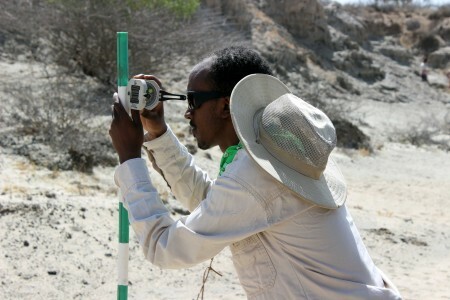 Tadele, Yemane and Evan record GPS points to map the extent of the Lower Ileret tuff (volcanic ash). 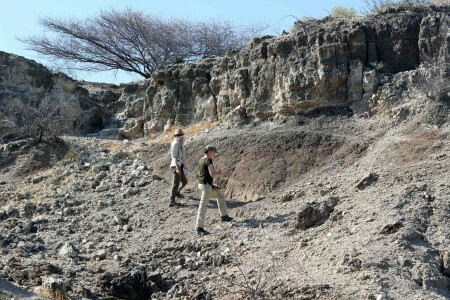 Niguss, Kait and Rob took off across the ridges to reach the upper dated limit of this area – the Chari Tuff that dates to about 1.38 million years ago. 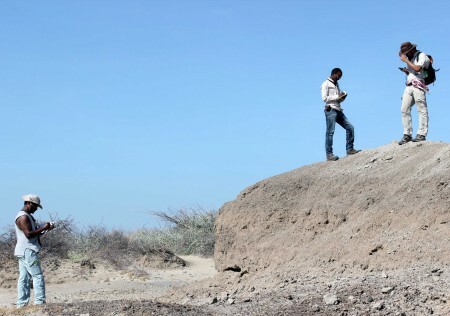 Niguss and Rob hike along the Chari tuff deposit to find the end of its extent on this ridge. 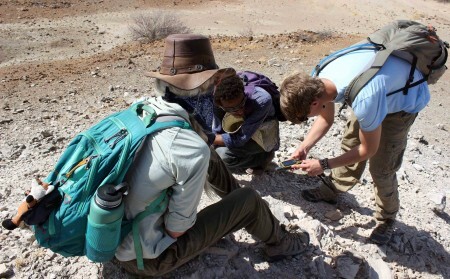 Kait, Rob and Niguss take carefully positioned GPS points to map the Chari tuff area. 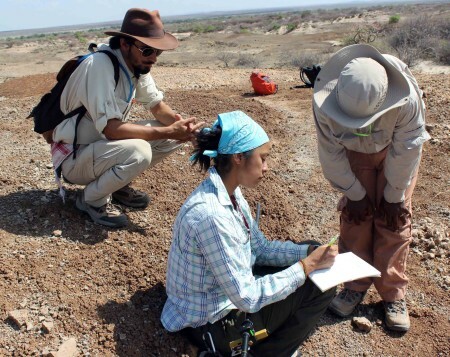 Prof. Raynolds assists Kait and her team in mapping the Chari tuff deposits. Finally, Joe, Max and Jamie map sediments found between the two tuffs that make up what we call the “main fish bed.” This layer is easy to spot with its location beneath a pink colored dolomite and has many fish fossils. 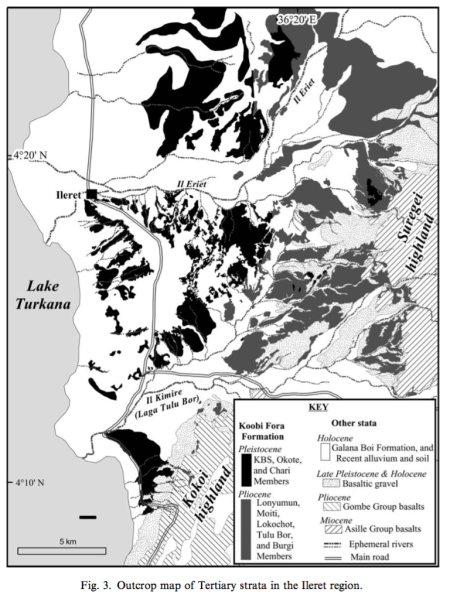 The deposit shows an ancient lake environment localized to the Ileret region. Max and Joe search for fish fossils to confirm that this red sedimentary deposit is in fact The Main Fish Bed. Jamie enjoys the strong winds blowing at the top of the ridge. After obtaining spatial information about these deposits, students next created a stratigraphic section of these same deposits. Students began at the base of set of rock layers and work they way up section from oldest to youngest recording the thickness of each distinct rock layer. In order to measure this, students leveled their Brunton Compass at a particular height of the Jacob Staff. 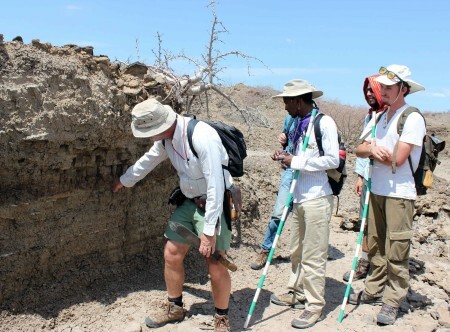 By examining a stratigraphic section, we can see how the landscape in one area has changed over time with the changing deposition (and erosion) of sand, mud, limestone, volcanic ash, and the features within each. Yemane gives it a try. Rob and Niguss get a little help from Director Linda Martin. Below are pics from the a section they measured. From the main fish bed up to the Chari Tuff. 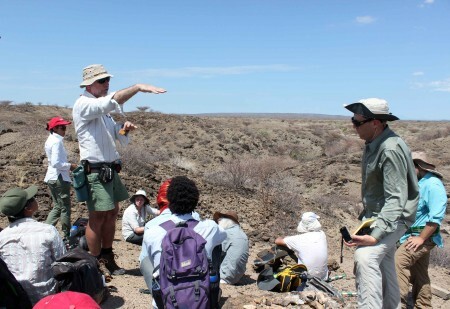 Dr. Feibel shows the students the area that they will use to create stratigraphic sections. Ryan and Joe step back to get a full view of the vertical cut to decide where they will start their measured section. Kait and Milena get a closer look at the rock layers. Prof. Raynolds and director Linda Martin assist students in constructing their section sketches. Director Linda Martin gives some tips to Tadele and Evan for their section sketch. Stay tuned for our overnight trip to the historic Koobi Fora camp and its surrounding region…. I am a Ph.D. candidate at Stony Brook University, NY and have the pleasure of being the Resident Academic Director of the TBI Origins field school for Spring 2017. 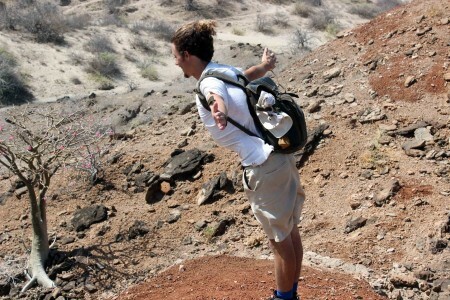 I study Early Pleistocene stone tool technology, and have been conducting research in Turkana since 2012. My dissertation research uses an experimental approach investigating when and how human ancestors started creating patterned shapes in their stone tools (< 2 million years ago).